Globally, invasive non-native species are considered the second most important threat to biodiversity after habitat loss. These are species introduced by human activity that flourish and spread in their new environment and threaten native species and ecosystem functions. 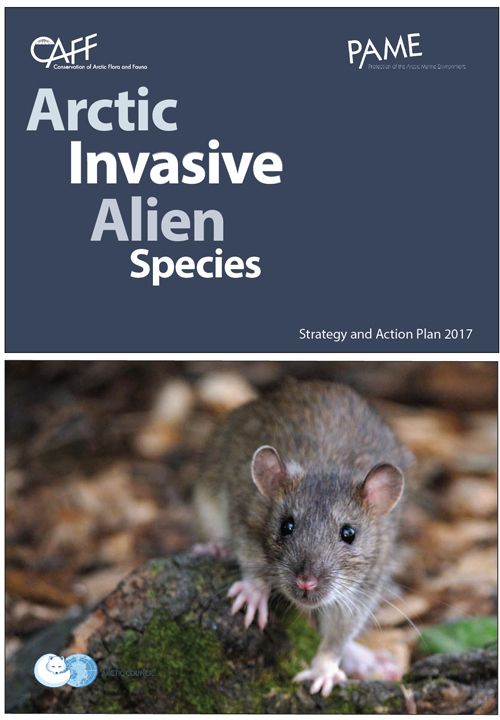 The Arctic Invasive Alien Species (ARIAS) Strategy and Action Plan, produced by CAFF and the Protection of the Arctic Marine Environment (PAME) sets forth the priority actions that the Arctic Council and its partners are encouraged to take to protect the Arctic region from a significant threat: the adverse impacts of invasive alien species. These priority actions span terrestrial, aquatic, and marine ecosystems. The actions take environmental, cultural, and economic perspectives into consideration, including drivers, impacts, and response measures. Goal: Raise awareness of the unique opportunity that the Arctic Council and its partners have to inspire the urgent and effective action necessary to protect the Arctic from invasive alien species. Goal: Improve the capacity of the Arctic Council and its partners to make well-informed decisions on the needs, priorities, and options for preventing, eradicating, and controlling invasive alien species in the Arctic by improving the knowledge base. Goal: Protect Arctic ecosystems and human well-being by instituting prevention and early detection/rapid response programs for invasive alien species as a matter of priority. All those who value the Arctic are invited to consider the relevance of these priorities to their goals and to take action, as appropriate. Achieving these goals is dependent upon cooperation and urgent action. Some of the actions identified apply to the Arctic Council as a whole, while others are best addressed at the working group level or through national implementation. It is recommended that Arctic States, Permanent Participants, and their partners integrate the ARIAS Strategy and Action Plan into national commitments, as appropriate, and employ these priority actions as a means to advance decisions under other multi-lateral fora and instruments. These priority actions provide guidance on where to start, where to place priorities, and where to invest in the future of the Arctic. This effort is particularly urgent for the Arctic region. Rapid climate change is making the region more vulnerable to invasive species introductions, and at the same time a rapid increase in human activity and transit and energy development in the region is increasing the chance of introduction of new and invasive species. There is an immediate opportunity, already largely lost in many other regions of the world, to proactively build resilience to the risks posed by invasive species to the Arctic's unique social, economic, and environmental systems. Reduce the threat of invasive alien/non-native species to the Arctic by developing and implementing common measures for early detection and reporting, identifying and blocking pathways of introduction, and sharing best practices and techniques for monitoring, eradication and control. This includes supporting international efforts currently underway, for example those of the International Maritime Organization to effectively treat ballast water to clean and treat ship hulls and drilling rigs. 9.1 (2015-2017): Develop a strategy for the prevention and management of invasive species across the Arctic, including the identification and mitigation of pathways of introduction of invasions. Include involvement of indigenous observing networks, which include invasive and new species reporting, to assist with early detection. 9.2 (2017-2019): Incorporate common protocols for early detection and reporting of non-native invasive species in the Arctic into Circumpolar Biodiversity Monitoring Program (CBMP) monitoring plans. How and where are living organisms likely to be introduced to Arctic ecosystems? Using existing information and expert knowledge identify trends in risks associated with human activities and rank the pathways by which alien species are likely to be introduced into the Arctic, and produce maps of the geographic locations where each pathway is likely to deliver organisms. Proxies of the likelihood of invasion, such as human density, human economic activity or shipping traffic might be used. Ranks might be based on the number of species transported and the frequency with which introductions might occur. All pathways would be considered, including transportation-related pathways (e.g., ships, ice-breakers, fishing vessels, drilling platforms, trucks, planes) and commerce in living organisms (e.g., agricultural, aquaculture, ornamental plants and animals, pet trade). Which species are both likely to be introduced and likely to be harmful? Use a literature review and other existing knowledge to create lists, identify trends and map alien species currently established in the Arctic, and any knowledge about invasive species impacts. Use existing global knowledge (e.g., about biogeographic regions, climate, environmental conditions) to create a map of the world indicating regions that might harbour species that could thrive if introduced into the Arctic. Use consensus building (e.g., horizon scanning) and/or statistical methods to develop risk assessment tools to distinguish species that are likely to be harmful (in terms of ecological, economic and health impact) from those unlikely to cause harm. Such tools could then be used by multiple Arctic Council members, helping to harmonize risk assessment outcomes across jurisdictions and therefore allow jurisdictions to avoid harm from a species that might otherwise be allowed into one jurisdiction and then spread easily to other jurisdictions in this region of shared ecosystems. Which high value locations (areas protected for biodiversity value, indigenous hunting and fishing areas, important caribou/reindeer habitat, etc.) are especially vulnerable to invasion? Use existing data (e.g. from ABA) and expert knowledge to map areas that are of high value (including for biodiversity) to enable more informed prioritization of prevention and management measures. Use a literature review, expert knowledge and where possible existing data, to make recommendations on best practices and techniques for early detection and monitoring (including synergies with CBMP), as well as eradication and control efforts for highly vulnerable areas for reporting for the member states. How can the different layers of information gathered to answer the questions above be integrated to identify locations and practices that are most likely to prevent future harm from invasions? Create a spatially explicit risk atlas of the Arctic by using expert knowledge and output from the efforts described above to elicit scores for ecological, economic and health risk (considering the probability of invasion and the probability of impact given invasion). The value of the resource should also be assessed in conjunction with each risk. Recommend codes of pathway practices to block invasions from prioritized pathways into prioritized areas of terrestrial, freshwater and marine ecosystems. Integrate risk atlas results and information on high-risk species and pathways to inform monitoring and other management activities (e.g., Hazard Analysis & Critical Control Points (HACCP)) that can contribute to early detection and rapid response activities. Liaise with other multi-lateral efforts developing similar broad initiatives to prevent the spread and establishment of invasive species into a region of the globe to share experiences, ideas and lessons-learned, and develop a system for collating and sharing information to meet future monitoring and management needs. What management activities and polices have been adopted to improve management of invasions? Identify and share trends in international and national efforts to address the impacts and risks of invasive species.